Redesigning this shirt in preparation for HowlCon (Maybe if I sell enough, I can afford to go. :P). This is a repository for all my really rough sketches, before they get cleaned up and posted to various galleries. There will be some NSFW material, but not much. Some of it will be kinda freaky (but you should know to expect that from me already). And some of it just won't make any sense. It's basically a mirror of the page I mentioned in this journal. Sorry it's not called fuckyeahkobilacroix. But that may soon exist (probably not). "As some of you might know, at the moment Kobi and I have roommates, but that situation is likely to change in a few months. We don't know when our roommates will move out yet but 1-3 months is not out of the question. We'll very likely need additional roommates if we intend to keep this place much longer, and I'd like to throw this out there so we can start talking about it now rather than at the last moment. Checking everyone out will take time and I don't want to be caught unprepared. We're located in a western suburb of Portland, basically on the "unfashionable" end of town, so there's not a whole lot to do but the crime rates are low. It's an ethnically diverse neighborhood, with very little social tension. We're about 45 minutes by public transport from the center of Portland, or about 10-20 minutes by car, and there is a light rail line that goes straight to the airport less than half an hour's walk away. Rent and utilities will be about $270-370 a month depending on how many roommates we get, how much electricity we use, and how high the rent goes when the lease renews. You should have either a job lined up, a few thousand dollars in reserve, or some kind of benefits (SSD, etc.). Expect jobs to be difficult to get or keep. NO HARD DRUGS. If you have any questions about what I consider "hard drugs," feel free to ask. You must be able to pass our apartment complex's background check to be on the lease. If you're interested, drop me a line and we'll talk. If you're someone I haven't met before, I want to get to know you before saying yes." I discovered a while back that the song which most of us know as the "Tetris Song" is actually based on a Russian folk tune called "Korobeiniki", or "The Peddler". I decided it would be fun to translate it into English, despite not knowing any Russian or bothering to learn what the song was actually about. The album you've waited way too long for has finally arrived…actually, no, "Sgt. Pepper 2, Revenge of Mr. Kite" is still in development. But this is almost as good. 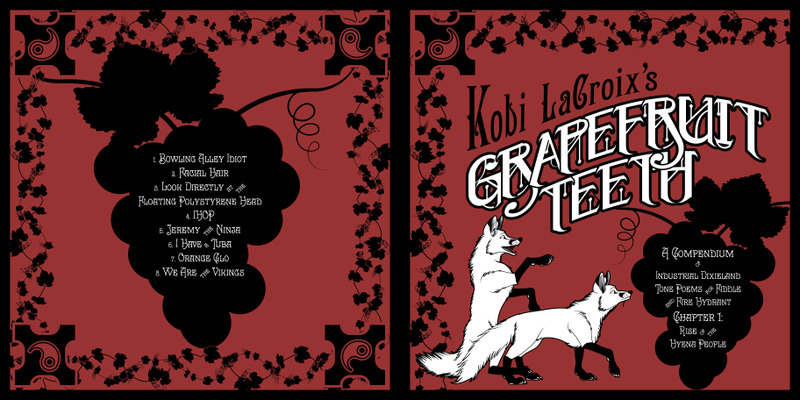 "Grapefruit Teeth: A Compendium of Industrial Dixieland Tone Poems for Fiddle and Fire Hydrant, Chapter 1: Rise of the Hyena People" is an EP of several comedy songs that I, Kobi LaCroix, have written between 2009 and 2012. Virtually all the songs have been freshened up, having either been remastered, remixed, or completely rerecorded since their initial release. This is a superbly funny album, covering topics such as food, ninjas, hypnosis, hypermasculinity, and household cleaning products, with musical styles ranging from metal, to funk, to industrial, to a cappella. It's an album you'll want to share with all your friends, even if they're imaginary! So pick it up today! I guarantee you've never heard anything. Like it! Er…I mean…you've never heard anything like it. Yeah. Tracks are available in MP3, FLAC, and other formats. Physical CDs will be available once we work out production and shipping costs. Due to the fact that a number of conventions are being held this weekend, I have decided to postpone the release of "Grapefruit Teeth" until Monday, June 18. This will also give me time to fine-tune any remaining issues and possibly add more material. "Grapefruit Teeth: A Compendium of Industrial Dixieland Tone Poems for Fiddle and Fire Hydrant, Chapter 1: Rise of the Hyena People" is an EP of several comedy songs that I've written between 2009 and 2012. Many of the songs have either been remastered, remixed, or completely rerecorded since their initial release. The EP will be released June 15 at kobilacroix.bandcamp.com. Digital downloads will be available in MP3, FLAC, and other formats. A lot of you might not be aware of this, but most of the artwork I make doesn't get posted online. Sometimes it's a sketch that's so unrefined that it's hard to make out what's supposed to be happening. Sometimes it's a more refined sketch, but I just didn't like where the idea was going, or I just couldn't get enthusiastic enough about it to finish it. Sometimes I do like the drawing, but other things get in the way of me finishing it. A lot of this is stuff that might never make it into any featured gallery for reasons listed above. Be warned, some of it's NSFW, some of it may not make a lot of sense, and some of it may just be really boring. But if you're really interested in seeing the crude bits and detritus of my artwork, there it is. I've decided my original Emerson Lake & Palmer style cover of daniwellP's "Nyanyanyanyanyanyanya" (AKA the Nyan Cat Song) wasn't quite ELPish enough, so I've added a few more touches. Hope you like it.